If you are looking for The Everything's ABC's blog hop, go HERE. Welcome to our January Art Philosophy Blog Hop! We are starting a new year of blog hops for you all featuring Close to My Heart's exclusive Art Philosophy Cricut cartridge. The Art Philosophy Cricut cartridge is available exclusively through a Close to My Heart consultant. This month we are featuring a "birthday" theme for you. In this hop, you will see projects featuring this versatile cartridge from many talented crafty ladies! Enjoy our blog hop! If you came from Kindred Hearts ~ It Makes Total Cents then you are in the right place! For my card, I used Saddle card stock. I cut the card using Art Philosophy cricut cartridge, page 26. To cut the card, make sure to choose the card button, then the button for this card is in the top row of the over lay with the heart on it. I cut the card at 5 1/2, and stamped the sentiment in White Daisy pigment ink. I then added bitty sparkles around the edge of the cut out, as well as on the i in birthday, and the exclamation point. 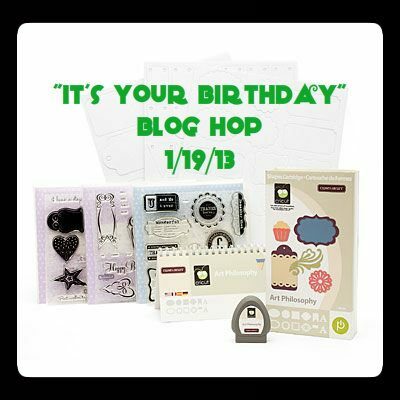 The Happy Birthday was stamped using the Part stamp set that comes with the Art Philosophy collection. I also used a sponge dauber to ink the edges of the card in White Daisy ink. I would have never paired white ink with this but it looks fabulous! Love the placement of the sparkles around the cut shape! Very pretty card! Love the brown with silver sparkles! Great cut out on card and all that bling, LOVE IT! !